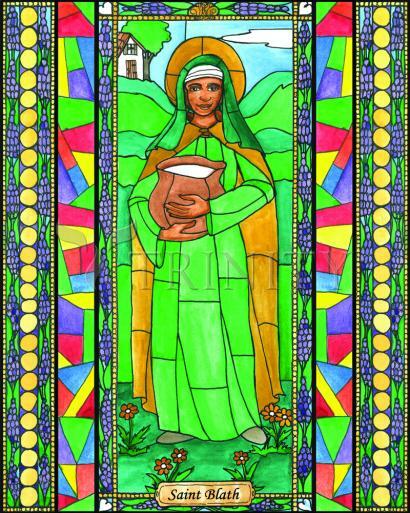 Though not much is known about Saint Blath, we do know that she was Saint Brigid's cook. There are stories of a miracle concerning Blath where an almost empty dearth of milk lasted well beyond what it should have after Blath continued to dip cup after cup of milk from the almost empty dearth for the poor. Her feast day is January 29. Among the several daughters of St. Brigid renowned for sanctity stands St. Blath (also known as St. Flora) of Kildare. St. Blath is commemorated, if she is remembered at all, on 29th January. She was a lay-sister in the Convent of Kildare founded by St. Brigid. As cook of the Convent, she earned a reputation not only for her heroic sanctity and her personal devotion to her foundress but also for her cooking. It is said that, under the care of St. Blath, the bread and bacon at St. Brigid's table were better than a banquet elsewhere. She is recorded as having been born to heaven in the year 523, about two years before the death of the great St. Brigid.